​Looking for a compact or high-torque brushless drill? Or a combination of both? We bring you the best brushless drills in the market that offer you greater durability, longer run time, increased power, and less maintenance work. They are great additions to your arsenal or as replacements to drills with brush motors. This compact red and black brushless drill features an all-metal gear case and half an inch metal chuck. It delivers 500-inch pounds of torque as well as 0-450/0-1,800 RPM for various drilling and fastening applications. It is designed with an advanced overload protection feature. The drill measures 2.3 inches by 7.7 inches by 7.1 inches and weighs 3 pounds. Batteries, charger, and other accessories are to be purchased separately. Its advanced overload protection feature shields it against an abusive application, overheating, and battery damage. It doesn’t come with batteries and a charger. For its price, other brushless drills already come with batteries and a charger. This yellow and black drill comes with three drilling modes that allow you to work with a wide-range of surfaces. You can choose the hammer mode to drill holes through masonry or concrete, the drilling mode to pierce through woods and plastics, and the driving mode to drive screws through pilot holes. Besides the three-mode selection, Ryobi P251 One+ Brushless Hammer Drill Driver is equipped with a 24-position clutch that fine-tunes your torque up to 750-inch pounds. It is also fitted with a magnetic bit holder near its base, a rubber-covered pistol grip, and a dual-position plastic side handle. This powerful drill is powered by Ryobi’s One+ line of 18V lithium-ion batteries. It is compatible with P100, P102, P103, P104, P107, and P108. The drill measures 9 inches by 8.3 inches by 2.6 inches and tips the scales at 3.55 pounds. Powered by Ryobi’s One+ line of 18V lithium-ion interchangeable battery system, it lets you use it with Ryobi product’s batteries in the similar line. The dual-position handle affords you ample support as you get tasks done whether you are right- or left-handed. Its overload protection feature can be pretty sensitive and will kick in more frequently than you’d want to, causing a few stops or pauses. Nevertheless, with its overload protection function working, you’d be rest assured that the tool will last you a long time. At 3.55 pounds and measuring 8.3 x 2.6 x 9 inches, it doesn’t qualify as a compact tool. This green and black professional-grade drill comes with 620-inch pounds of torque and up to 1,800 RPM that can work through wood, plastic, thin steel, and aluminum. It is designed with a ratcheting 1/2-inch keyless, all-metal chuck, as well as 22-torque settings and drill mode. It has an optical trigger switch that allows variable speed operation. It also comes with a built-in LED light, an on-tool battery indicator, and a metal belt hook to keep the drill close by. The drill measures 6 inches by 2 inches by 6 inches and weighs 3.5 pounds. Hitachi’s lifetime lithium-ion tool warranty covers it. Meanwhile, its lithium-ion battery and charger come with a 2-year and 1-year warranty, respectively. Its keyless, all-metal chuck makes bit replacement fast and easy. It also comes with a built-in LED light that is handy in low-light areas. Its slide-type batteries are not compatible with other Hitachi products. It’s double the price of other brushless drills. A bit storage would have been greatly appreciated. All three products are well-designed brushless drills. While solid, all-metal, red and black Milwaukee 2702-20 Compact Brushless Hammer Drill is quite basic, the yellow and black Ryobi P251 One+ Brushless Hammer Drill Driver and the green and black Hitachi DS18DBFL2 Brushless Driver Drill is fitted with extra features. Ryobi P251 One+ Brushless Hammer Drill Driver comes with an anti-slip rubber-covered pistol grip, a dual-position plastic handle that accommodates right-and left-handedness, and Ryobi’s One+ batteries that are interchangeable with other Ryobi 18V lithium-ion powered products. Meanwhile, the Hitachi DS18DBFL2 Brushless Driver Drill has an integrated LED light for easy operation under low-light conditions and an on-tool battery indicator to provide you heads-up on battery power status. Both models have a metal belt hook that makes it easy to keep your tool nearby whether you are working from a low or high area. The Milwaukee 2702-20, Ryobi P251, and the Hitachi DS18DBFL2 Brushless Driver Drills are all great in getting drilling projects done on wood, concrete, plastic, and occasional thin metal surfaces. However, the Ryobi P251 One+ Brushless Hammer Drill Driver surpasses the other two packed with 750-inch pounds of torque. Still, its ultra-sensitive overload protection function requires the tool to rest a few seconds before completing the job. 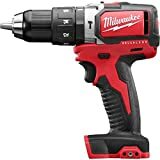 Hitachi DS18DBFL2 Brushless Driver Drill comes second with 620-inch pounds of torque, while Milwaukee 2702-20 Compact Brushless Hammer Drill is last at 560-inch pounds. Of the three, Hitachi DS18DBFL2 Brushless Driver Drill comes out as the most expensive, priced a little more than double the individual price of each competitor model. Meanwhile, Milwaukee 2702-20 and Ryobi P251 One+ Brushless Hammer Drill Drivers belong to the same price range with only a few dollars of difference between them. 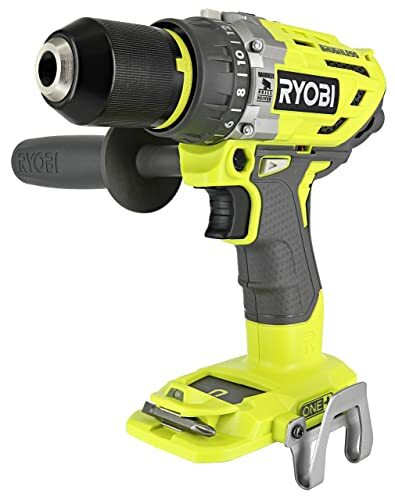 Interestingly, the former which has basic features and doesn’t come with batteries and a charger is more expensive than the more powerful Ryobi P251 One+ Brushless Hammer Drill Driver which is supplied with Ryobi’s interchangeable battery system, a charger, a dual-position plastic-handle, and a metal belt hook, among others. If you are looking for the best brushless drill, then any of the three is a good choice. In the compact brushless drill category, the Milwaukee 2702-20 Compact Brushless Hammer Drill is perfect. If you’re looking for a high-torque tool, then the Ryobi P251 One+ Brushless Hammer Drill Driver packs a lot of power although you’ll get a lot of stops or interruptions from its ultra-sensitive overload protection feature. 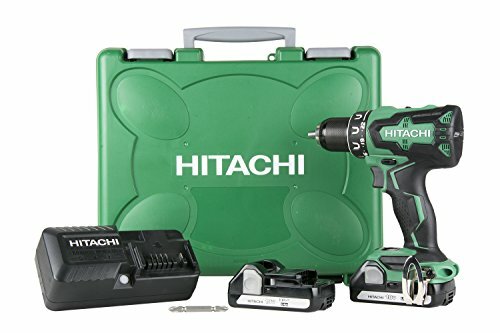 But if you want a good combination of speed and power and don’t mind paying double the price of the two previously mentioned brushless drills, then you should get the Hitachi DS18DBFL2.